Lahore, Pakistani hockey team is busy in the preparation of the FIH Champions trophy and it has won the series by 2-0 of the 3 hockey matches between Pakistan vs. Austria. Pakistani team is playing the hockey matches against Austria and it is present in Breda, a city of Holland. Pakistani hockey team has completed the series of 5 matches against the local club and Austria. Rizwan Senior is the captain of the national hockey team of Pakistan. 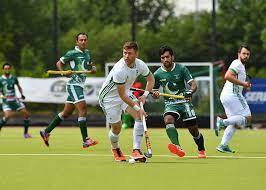 Pakistani hockey team won the third and last match against Austria in the series and won the series by 2-0. Arslan Qadir was looking in tremendous form and he scored 2 goals in the last match and he won the award of the best player of the series by making 5 goals.